team manager Eric Ogweno has revealed. 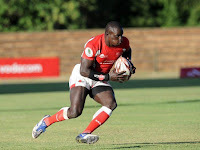 Despite a shaky performance in their last outing in Cape Town, where Shujaa bagged a paltry three points, Ogweno was upbeat about the team’s prospects for the next leg in Sydney. Shujaa clinched their first tournament under Benjamin Ayimba at the 2016 Singapore Sevens beating Fiji 30-7 in the final but since then, they have struggled to make onlt three quarterfinal appearances, the latest being the 2017/18 opening leg in Dubai two weeks ago. “Our target for the season is 100 points and we are on course. We are looking at 17 points in Sydney which translates to a semifinal berth which we believe is achievable,” noted Ogweno. Shujaa closed last season on 63 points and will need to rake in at least 10 points in each of the remaining legs. Shujaa captain and Kenya Commercial Bank forward, Andrew Amonde, who missed the Dubai and Cape Town assignments is expected to have recovered from injury to take the place of injured Dennis Ombachi, who could be out until April or May. Amonde said he is feeling better, ready and inspired to return to the Shujaa squad having last featured in the 2016/17 Series season-ender in Scotland. “I’m also working hard not to miss the call-up for Commonwealth Games and 15s World Cup qualifiers next year,” said Amonde. Meanwhile, South Coast Pirates and University of Eldoret’s Trojans recorded their first wins in the Kenya Rugby Union Championship on Saturday. At Ukunda, Pirates overcame Catholic Monks 31-24 while Trojans edged out Kisumu RFC 13-10. Three matches scheduled for the weekend were postponed. Oilers vs Egerton, Bulls vs Moi and USIU vs Machine matches were postponed to next year as the championship takes a festive season break. UOE scored through Alex Mwange, who landed a try with Edwin Yatich converting. Yatich added two penalties for the hosts while David Nyaundi and Stephen Obadiah touched down for Kisumu. Following the win, Trojans moved to seventh with six points while Pirates are eighth with five. Oilers go into the New Year as log leaders with 20 points having won all their matches followed by Mean Machine (14) while Western Bulls are third with 13.